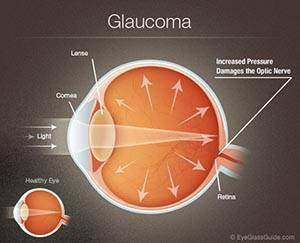 Glaucoma is the generalized name for a group of eye diseases that damage the optic nerve of the eye, preventing the eye from sending accurate visual information to the brain. Glaucoma tests are designed to test your eyes for one of the key symptoms of the disease—increased eye pressure—however only a comprehensive eye exam can reveal whether or not you have glaucoma. Increased pressure inside the eye is often a key indicator of glaucoma, though not exclusively so. Eye doctors in Eugene and Bend can use a number of tests for eye pressure, but will, by default, check for signs of glaucoma as part of a detailed examination of the retina—the light sensitive area at the back of the eye responsible for processing images. Glaucoma can cause slight to severe vision loss, and is often discovered only after the disease is present—that’s why glaucoma testing is so important. Have a test anytime in our Eugene and Bend clinic.